A historian of the early modern era, Codignola-Bo is former professor of Early North American History at Università di Genova (Italy), where he served on the faculty for 25 years. His career also includes four years as head of the Institute of History of Mediterranean Europe of Italy’s National Research Council and recent affiliations with University of Toronto, Université Laval, and Saint Mary’s University (Halifax). The author of 10 books and editor of more than a dozen volumes, Codignola-Bo’s recent publications include Little Do We Know: History and Historians of the North Atlantic, 1492-2010 (edited by Binasco, his former student, and published in 2011); and the six-volume Calendar of Documents Relating to North America (Canada and the United States) in the Archives of the Sacred Congregation “de Propaganda Fide” in Rome 1622-1846 (2012). “I have long followed the activities of the Cushwa Center from afar, and found it a vibrant community with interests spanning from the early days of Catholicism in North America to the more current issues being debated within the U.S. Catholic Chuch and their worldwide ramifications,” Codignola-Bo said. 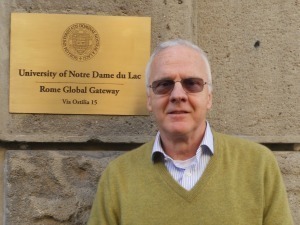 Cummings, Codignola-Bo, and Binasco will convene a meeting of Rome-based scholars this March to work on the North Atlantic Catholic Communities in Rome project, which is now in the planning stages and is scheduled to culminate in an international conference in 2017. The project aims to identify, preserve, and disseminate Catholic archival records related to North Atlantic religious communities that worked in and from Rome—communities that have been at the margins of mainstream historiography. Through identifying and preserving the Church’s archival heritage across the English-speaking world, the project will serve as a basis to illuminate the truly global nature of Catholic history and mission. Originally published by Heather Gary at cushwa.nd.edu on February 08, 2016.